In A Day’s Work, We’re All You Need. It’s the combination of over 20 years of experience in shipping and logistics, facilities management, printing and staff management at QAMS, which inspired us to develop PremierOffice – the new industry standard for office-service automation. Our newest software takes the age-old, multi-tiered office environment and succinctly delivers time-efficient and cost-effective workflow management. Authenticated through Google – PremierOffice promises a secure cloud-based software which combines many facilities management solutions into one self-contained system – introducing our Request Work, Meeting Room Booking, Visitor Control, Logs & Manifests, and PremierShipping modules. Our goal for you is clear​ – from our single fluid and robust system, you will benefit from significant cost savings, the flexibility of mobile productivity, ease of report generation & accountability for action. Make a requisition and check it off your list. You can now compile all your requisitions in one place. This seamless system will direct your support task requests to their respective departments, monitoring progress continuously. Make room in your day for more important things! Streamline your internal processes to meet your exact needs. With our one-on-one consultation services, we give you logs configured to your workflow. Easily track and control all those incoming, outgoing and inter-office deliveries with scanning to upload, digital signatures and real-time tracking – saving you time, paper and expensive storage space. Not sure you’re getting the best shipping rates? Learn more about our practical PremierShipping system – offered standalone or as a module in combination with PremierOffice. See what makes this system so popular! Need to book a meeting room? Double-booking a room or choosing the wrong one is a thing of the past. With this module, it’s easy to make informed decisions in very little time – watch it get booked and check it off your list. It’s all here – we have a Visitor Control module that will get your visitors checked in with ease either individually or in groups. Transform your reception desk with this streamlined solution – allowing for increased security and a system that meets all your needs. PremierOffice gives us clear visibility into what work is getting done, by whom, and when. The simple yet powerful platform allowed us to easily cross train our administrative staff and gain huge efficiencies. We now get much more work done faster, and with fewer people. The Visitor Control feature was critical in helping us achieve PCI DSS compliance. PremierOffice is an obvious choice if you’re looking for cost savings and improved service. We moved to PremierOffice under a year ago, and we are very satisfied with the results. 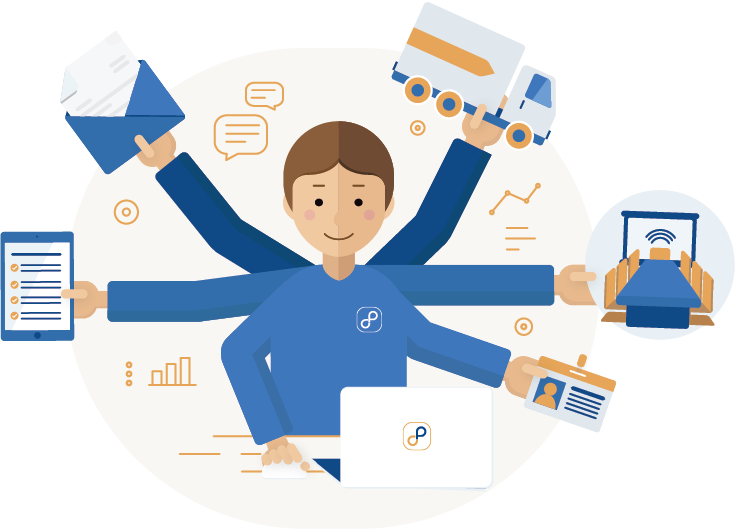 Not only did they meet our very unique needs in terms of our complex chargeability, but with the benefit of software customization, with PremierOffice Shipping, we are able to have a courier system that makes sense for us. We have been using PremierShipping from QAMS for about a year now, it has improved efficiencies tremendously. Prior to PremierShipping we were using a vendor provided computer to ship out our packages so only one person was able to process our outgoing couriers. With PremierShipping having an on-line web based platform we are able to process packages from any computer in our office saving a ton of time. We also save a ton of time tracking our packages. Prior to PremierShipping we would need to look up our internal delivery forms in order to find the tracking number then go to the courier’s website then enter the tracking number. Now we just log on to Easy Ship look for the package we sent and click on the tracking number which takes us directly to the couriers website and shows us its status, a huge time saver. Before I use to receive invoices from our different courier companies which took time and money to process and pay, now I receive one invoice from QA and I’m done. The PremierOffice team is excited to show you the ins-and-outs of office-service automation. Contact us today to see your new way of doing business. © 2018 QAMS | All rights reserved.